Two male students were taken to hospital Monday afternoon after an assault at a Winnipeg high school. 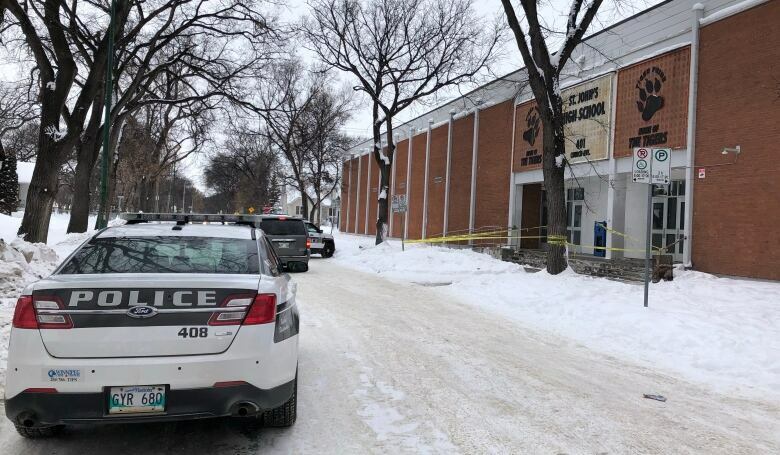 Winnipeg police were called to St. John’s High School around 2:30 p.m. to respond to an alleged assault, police said. Two boys were taken to hospital in stable condition. In a letter to parents, Doug Taylor, principal of St. John’s, said both boys were students. He said a fight broke out between three students in front of the school. “Two students were injured and 911 was called. Emergency services attended quickly and the two students were taken to hospital. The third student left before Winnipeg Police Service arrived,” Taylor’s letter said. The school was under a hold-and-secure from 2:30 p.m. until 3:05 p.m.
Clinical support services will be available for students who need them on Tuesday, Taylor said. Winnipeg police Const. Jay Murray said he couldn’t release more information about the nature of the boys’ injuries or whether police are looking for more than one suspect. “We believe the suspects are still outstanding, so we don’t want to release too much information … so that we don’t compromise the investigation,” he said. Investigators are still at the scene, he said. Around 3:30 p.m., police tape was up at the school’s Church Avenue entrance. Police are likely to release more information on Tuesday, Murray said. Today at 2:30 p.m., St. John’s High School went into a hold and secure in response to an altercation between three students that occurred in front of the school. Two students were injured and 911 was called. Emergency services attended quickly and the two students were taken to hospital. The third student left before Winnipeg Police Service arrived. Police are investigating. I would like to commend and thank the staff and students who maintained a calm and measured response to the situation. Students and staff were safe at all times during the hold and secure, which was lifted at 3:05 p.m. Clinical Support Services will be on site tomorrow for any students who feel they need additional support. Should you have any questions about this occurrence please do not hesitate to contact the school.